YuanBo Engineering Co., Ltd. located in industry zone No.88, Hengshui city, Hebei province, China, is a professional supplier of bubble level vials for more than 10 years. We have advanced production equipment, rich experience, high standard quality testing equipment, skilled workers, professional salesman and kind after-sale service. 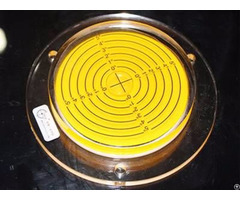 Our products are widely used in engineering machine, leveling instrument, photographic equipment, electronic scale, household appliance and so on. Our products cover glass circular bubble level, glass tubular high precise level vial, glass tubular common level vial, plastic circular bubble level, plastic tubular bubble level, metal bubble level, strip type bubble level and so on. 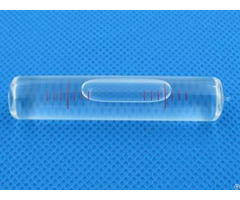 The color, shape and dimension of the bubble level vial can be customized according to the customer's application and using habit. There is a transparent glass tubular spirit level vial of high precision on the ground. We provide glass tubular bubble level of sensitivity from 2" /2 mm - 20' /2 mm.There is a transparent glass universal spirit level vial on the ground. 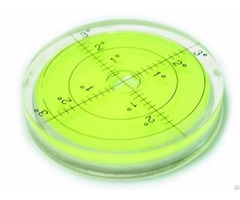 The glass circular bubble level have common sensitivity but can measure the angle of all the direction. There are several tubular and circular glass bubble level vials on the ground. We supply various kinds of plastic spirit level vials used in leveling instrument, household appliance and so on.There is a metals bubble level vial with fixing hole on the ground. Our metal level vials can be installed on the instruments and equipment easily. Why choose YuanBo Engineering Co., Ltd.? We adopt the most suitable material for all kinds of bubble level vial for various application. For example, we use glass material for the high precise bubble level because the glass have high transparency and is not easy to transform. The plastic material is used for the decoration bubble level vial for its high hardness. We use metal bubble level when we need to fix it on some equipment. Since the establishment of our factory, we have devoted ourselves in the research of bubble level technology. We combined the traditional craftsmanship with the modern high-tech. With years of hard-working, our products have great improvement in both appearance and quality. We can make sure 10 years using life during which the spirit level will not leak. During production, we use advanced machinery to make sure the bubble level's beautiful appearance, precise sensitivity, long using life and precise dimension. Before delivery, we will have precise testing for the spirit level vials, so that we can make sure every level vial delivered available. All of our workers in the important posts have more than 3 years experience. We have one month technical training for every new workers. Our salesmen are not only know selling, but also professional in production, installment and using. Our customer can know little about the products and our seller will give the sincerely instruction in choosing the suitable bubble level. Our salesmen can communicate in English and our customer will feel comfortable during the whole cooperation. We provide first-class service before selling as well as after selling. We give detailed explanation and direction patiently to the customers and the customers can feel free to ask any question about the products. 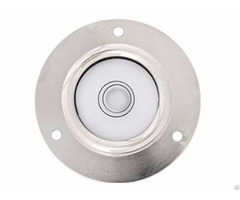 We will also help the customers solve the problem in installation and application after selling.